All Replies on Cutting 1/32 strips from a 1x1? Cutting 1/32 strips from a 1x1? The band saw’s table is askew which makes straight cutting neigh impossible. Band saw would be the safest way IMO… what exactly is wrong with the table? They are pretty easy machines to fix. Then you could rip them with a very simple fence (even just a 2×4 clamped to the table). You might also want to do a quick google search for ‘thin-rip jig’ for another alternative. You can purchase them from several places or make your own pretty easily. Work on a table saw as well. My TS with an incra will cut exact 1/32” slabs. Come on over one afternoon and I’ll cut a bunch for you! For various reasons I often cut thin strips, I think I can get 1” depth using the regular freud 7 1/4” circular saw blades- thin kerf, and not too many teeth, using my 10” contractors saw with reasonable results. I have made fixtures to do the same but much better on a shaper, but that’s another story. The table saw we have also has the incra, problem though is the waste a table saw would eat up. 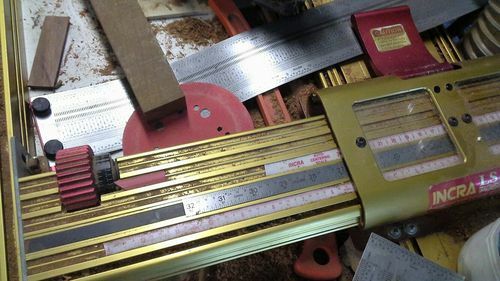 Im hoping to get at least 10 1/32inch strips out of a 1 inch pen blank. Band saw would be the safest way IMO… what exactly is wrong with the table? They are pretty easy machines to fix. Then you could rip them with a very simple fence (even just a 2×4 clamped to the table). You might also want to do a quick google search for thin-rip jig for another alternative. You can purchase them from several places or make your own pretty easily. Work on a table saw as well. -- "Nature is truely unique." The table on the band saw looks to have been bent as if it fell some time in the past so its about 2-3% off a square 90degrees with the blade. The table is designed so it can be tilted left and right, so if that is the direction of the ‘tilt’, most likely it can easily be corrected. If it’s tilting front to back, then it’s not a problem. A band saw is the safe way but you can do it with a table saw. Use a thin strip jig ( sold by Rockler ) a thin kerf blade and with a piece that small I would Hot glue it to a larger board then you could cut it safely. The thin strip jig will give you constituent pieces and they fall off to the outside of the blade so your not getting them caught between the fence and the blade, also you will want a zero clearance throat plate. Any table saw, zero clearance insert, and a good push shoe. Rip the strips against the fence. No jigs required. For something the size of a pen blank just use a hand saw. Should be pretty easy to make a jig similar to whatever the 90 degree bit in a mitre box is called with a block 1/32 to the side. The table is designed so it can be tilted left and right, so if that is the direction of the tilt , most likely it can easily be corrected. If it s tilting front to back, then it s not a problem. The table is level with the floor, but bent on the y axis (the vertical axis) by about 3 degrees so a fence attached to it would would not be parallel with the blade. Still works fine for freehand cutting but doesn’t do a good job with precision long cuts. That’s why i was thinking of picking up a new one. Definetly looking into those thin kerf blades and thanks for the youtube vid. Thanks for all the ideas folks, these are helping tons! to see where the problem actually is.